This harmonica box is designed to hold 8 harps with room for more. The lid flips closed with the harps still inside. Each section is felt lined. When open, the lid serves as a playlist/music holder. There is a large lower section for a microphone, large harp or spares. Box width is inside that of a typical tripod microphone stand, thus reducing the chance of knockover. You can use this box for storage as well as on stage. 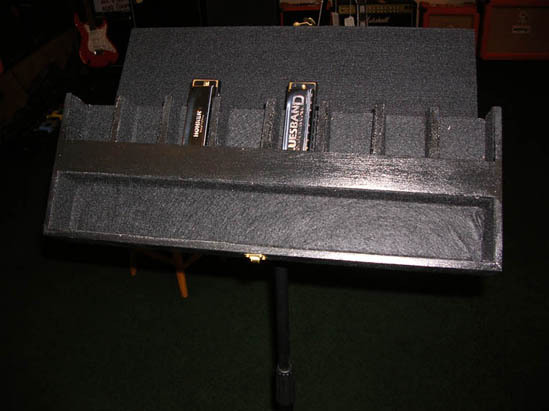 Each harmonica section is just tall enough to hold the instrument in place, yet short enough to allow you to pull them from the top. 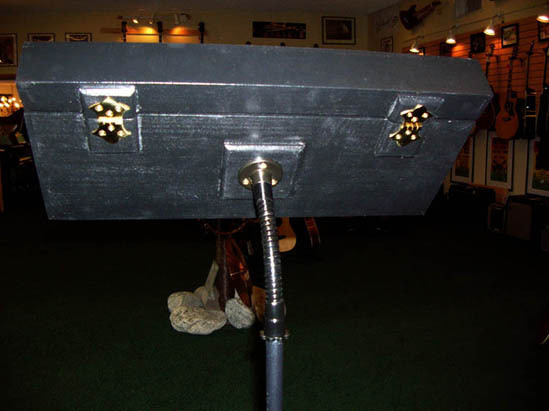 No need to dig in a box, fumble around on a stool, or risk spilling your harps onto the ground. On the back of the box is a threaded piece that allows you to connect the box to a standard microphone stand. Here, we show a 9-inch flex piece (not included) between the stand and box. 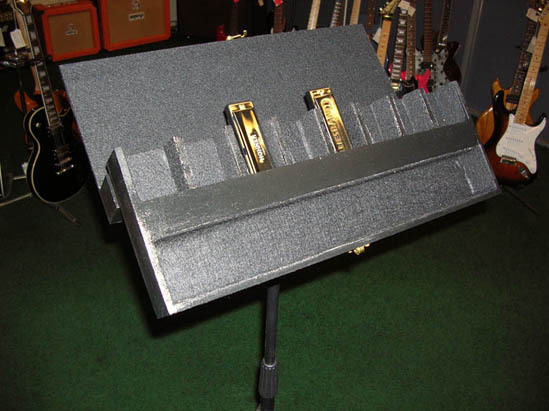 This gives you great flexibility when on stage and keeps your instruments within easy reach. The box measures 16 x 7 x 2 inches and weighs about a pound and a half. Finish is black enamel paint with brass hinges, brass hasp, and threaded microphone post connector included. We have four black boxes for sale and one "natural" finish (clear coat over poplar). One black box has red felt, all others have black. These were tricky to build and we're not likely to make more. This made for an interesting project that solved a problem for a friendly harp player friend of ours. Contact us if you have any further questions. Buy your harmonica box before they're gone! We will update this page after each order. After receiving your order, we will contact you with images of your exact box before shipment. With your OK, we will then accept the order and ship right away.